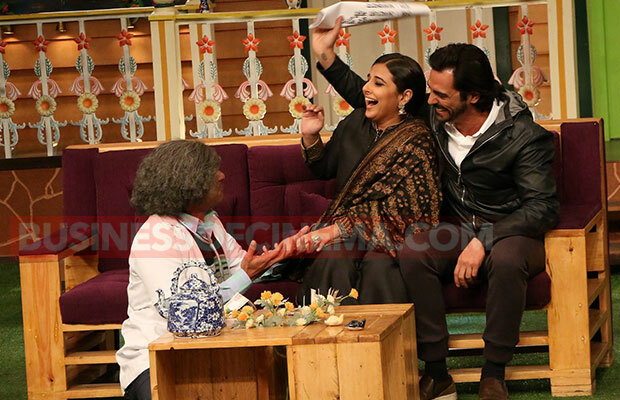 Bollywood stars Vidya Balan and Arjun Rampal appeared on Kapil Sharma‘s show for the promotions of their upcoming suspense thriller film, Kahaani 2. The ban put by PM Narendra Modi on Rs 500 and Rs 1000 notes is one of the hot topics in the country. Arjun Rampal and Vidya Balan along with Kapil Sharma will be seen giving a witty take on the same in the upcoming episode of The Kapil Sharma Show. While Arjun Rampal‘s film Kahaani 2 is slated to release on December 2, his much-talked film Rock On 2 has hit the screens today on November 11. Arjun and Vidya had a gala time together on the show as they played some fun games with Kapil. Kahaani 2 is a suspense thriller film directed by Sujoy Ghosh and is a sequel to 2012 film Kahaani. This is for the first time Arjun Rampal and Vidya Balan will be sharing the same screen space. Vidya Balan does some dance moves with Sunil Grover aka Dr. Gulati on Kapil Sharma‘s show. Arjun Rampal also danced with his fans while Kapil took the mic and mesmerized the audience with his singing. Vidya Balan clicked as she shares a candlelight moment with Navjot Singh Sidhu. Next articleAamir Khan All Set To Launch Dangals First Song On Children’s Day!